Not much to report, as the watering has slowed to a minimum (just tonight we added a hundred or so gallons of municipal water to the tank, because we're getting only about 35 gallons per day from the sump -- this is good news for the house, of course) so everything has slowed down on the growth spurt. My longterm plan is to find a place to stash about 10,000 gallons of water storage so we can do a water battery for the summer. We're dumping excess water well into May, and I'd like to be able to save it for later. Some of my location ideas are a little on the stupid side, but that's what brainstorming is all about. In the meantime, we have some summer vegetables coming in. Here's a zucchetta, which is a new one for us. The plant was a gift from friends who started too many. 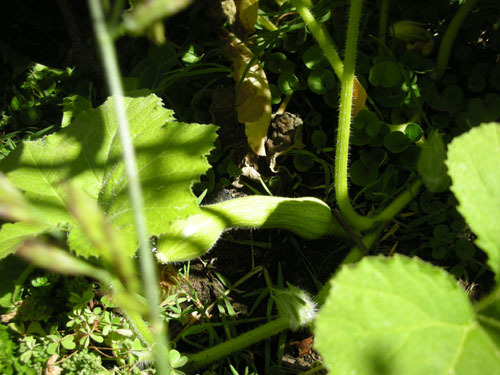 I'm assured that zucchetta do not get out of control huge like zucchini. 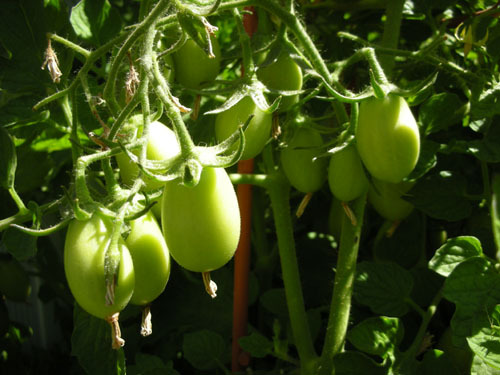 And the major tomato harvest this year will be Romas. There's lots of sauce-making in our future, so we getter get our butts in gear on that pantry. I also need to put up the anti-dog fence, because Rosie has been grazing in the tomatoes all summer so far and there's only so much of that I will tolerate. Once again I failed to prune the tomatoes at all, so they are in delightful abandon all over their bed. More so because they've had a dog rummaging around in them. In semi-related news, did you know you can wear out a grill? I didn't. Well, this is a combination of wear and rust, but the end result is the same: that old gas grill is not going to be working for us any more. The grills for that model are no longer available, either, so a replacement would be a lot of work and money better spent on other things. So on Sunday afternoon we made a field trip to a few hardware stores and got a new grill. 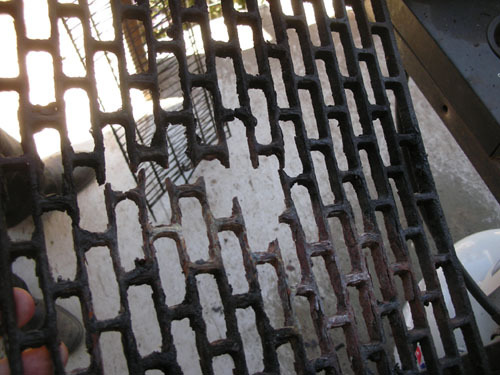 This one is smaller (a big plus for us) and as you can see fit fairly well into the old bottom of the old grill, with a small platform made of... cementitious siding scraps. We're all about the re-use here. And we have lots of scrap left over from the chicken house. I'm thinking of making a little fire pit for burning certain kinds of weeds (it all comes back to the garden in the end), so maybe there's a use for the old burners, as well. Of course, burning weeds maybe not be the most environmentally responsible thing to do, but sometimes it's nice to have a little fire in the evening, when the fog rolls in but you're not ready to retreat indoors yet. You'll love your new bbq -- we purchased the same one over two years ago (I am the chief griller in our family, the person who cleans and always repaired the old grill, and who lugged the newly filled propane tank into the backyard) but it took a lot of convincing of my spouse before we saw eye-to-eye on this baby. Well, we couldn't be happier with it -- easy to clean, nothing has rusted on it, and as an added bonus for me, I can use the little propane tanks that the home reno stores sell for propane welding torches (no more lugging the big propane tank out back). There is absolutely no downside to this unit. Enjoy! Wow, thanks for the endorsement, Peg! 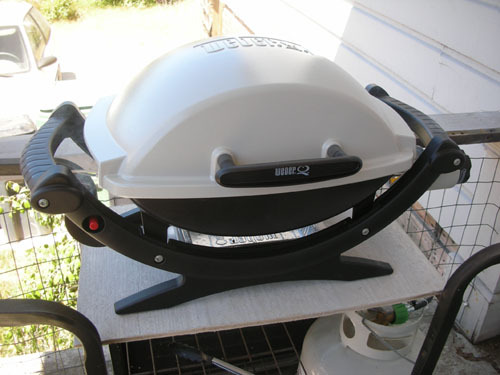 We chose this one because it was the right smallish size and seemed to have the type of grill surface we wanted, but we didn't do much research. We're happy with it so far: we brought it home and grilled lunch on it immediately. Of course, the previous grill would come off in chunks in our food so it's not like we had unrealistically high hopes for this one.